This is desert highlands and a beautiful part of the Sonoran Desert. (not much left with all the development) There are some jeep trails here and this area is also used by ATV and dirt bikes. Most of them stay off the singletrack. From the parking area I head northeast and follow the powerlines along a jeep trail for a mile or so. 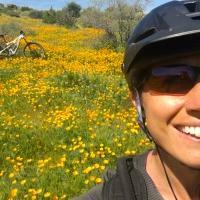 It\'s a good warm up before you hit the singletrack. You\'ll see singletrack trails branching off of this jeep trail on the right that head out to several rock outcroppings in the distance. As you head toward these you will cross other trails. It\'s hard to get lost because you can always follow the powerlines or look at the many landmarks. Some trails are numbered. 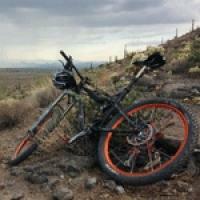 It\'s a great ride because as you ride north you are gradually gaining elevation on a trail that has a lot of short ups and downs through boulders. It takes some skill to be able to get good speed going down to clear the uphill part. Lots of shifting and braking. The ride back is downhill and like a rollercoaster! Let it rip! Review: Drive up to the browns ranch trailhead. You can park at dynamite and Pima, but the power line road is mostly deep, soft rock for a mile . This is a fantastic, well laid out, easy trail system. You can ride for days on rolling switchbacks. Very few technical spots but there are plenty of good views and you can get your cardio with distance. More technical riders will like the relaxed ride and newbies will find it challenging but not intimidating. Make sure to grab a trail map! Review: Awesome. Pass up the place the gps drops you off on and turn left to avoid the sand. 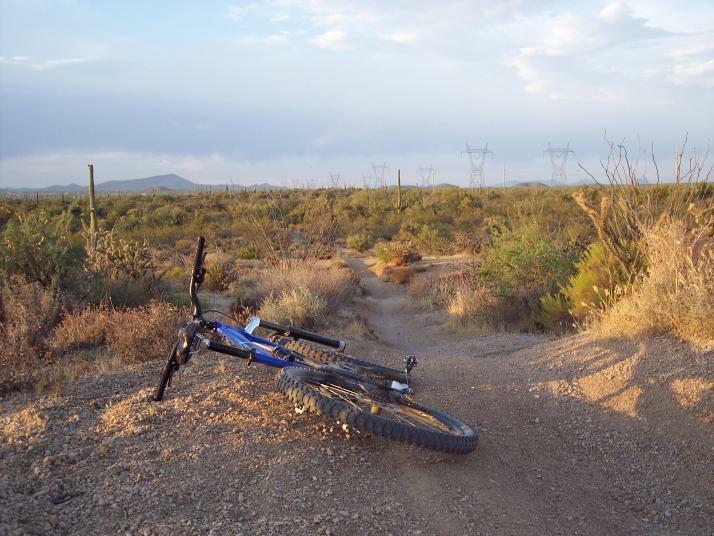 Review: This is a pretty extensive trail system (It's really part of the Scottsdale McDowell Sonoran Preserve North trail system, but this is the name that Singletracks knows it by) with different trails for differing skill levels. You should be in good cardio shape for these trails though, as there are a lot of climbs. Also be aware that there are a LOT of Cholla close to the trails, so be careful on the downhill curves. Review: Desert in bloom, beautiful. 16 miles around Cholla & Granite Mountain loops, 2 hours 15 minutes with photo stops. Review: I recommend going north on Pima Rd there is a better entrance right before the intersection of Pima and las piedras. This has to be my favorite course right now. Lots of challenges and jumps and shifting. I had a blast! Review: Started at Browns Ranch trailhead and headed east on the power lines to granite mountain loop which was really good single track. Took that to trail 4 which I was hoping to take to the browns mountain trail. It was fairly miserable with lots of deep sand. Luckily it branches off on a bunch of other numbered trails that I was able to take back to the granite mountain loop. Some of the trail finding was difficult due to closed trails. Overall good time and lots to explore. Review: Wow. Awesome trails. Easy gradual uphill. Fantastic downhill. Lots of potential jumps. There are some sand areas on the main trail that follows the east/west powerlines, but it can be avoided. No rocks in the trails. Beautiful desert scenery. Highly recommended - even for a beginner. Don't touch any metal on your bike while under the power lines. Ouch. Review: Great ride! Lots of fun ups and downs, don't be deterred by the atv tracks in the first 100 yards or so. Keep going north and look for the single tracks that start branching off. And have fun!! Pima Road and Dynamite Blvd MTB Trail 4.54 out of 5 based on 13 ratings. 13 user reviews.